Soroptimist House of Hope (SHOH) attended the 3rd Annual CCAPP Conference held October 27- October 30, 2016 in San Diego Mission Bay. At the annual CCAPP Membership Meeting, Soroptimist House of Hope was awarded the CCAPP Above and Beyond Award. 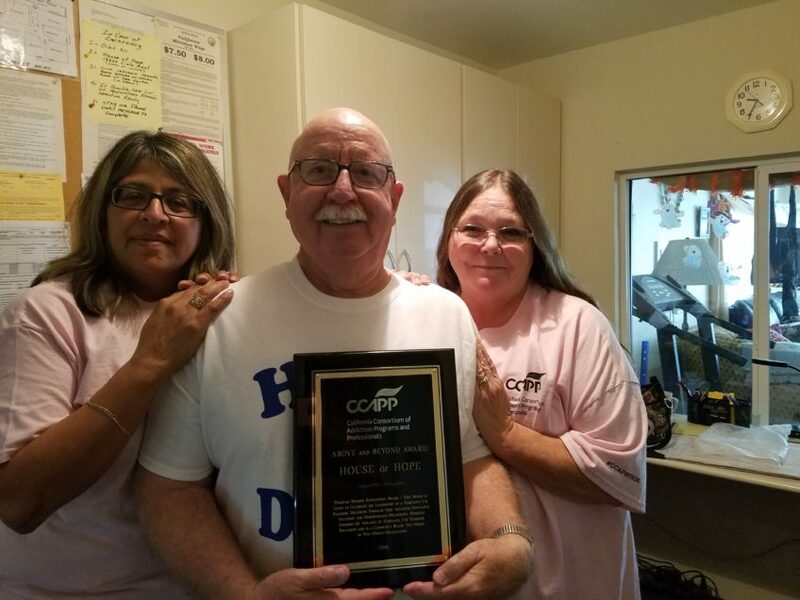 The CCAPP Above and Beyond award is a Program Member Recognition Award which celebrates the leadership of a Substance Use Disorder Treatment Program that advances innovative solutions and demonstrates meaningful progress towards the advance of Substance Use Disorder Treatment and is a community based for-profit or non-profit organization. SHOH was nominated by our Senior Counselor Leslee Blake and it was a great honor to receive this recognition from our beloved trade association CCAPP. “Thank you Pete Nielsen, CCAP CEO, and all of your awesome team. Both Lupe and I are active CCAPP Board Members (Credentialing and Membership respectively) and are eternally grateful to the CCAPP organization for their guidance and support as we continue to move forward in the ever changing landscape of Substance Use Disorder Treatment,” said Cynthia “Oma Gray, SHOH Executive Director, when commenting on receiving the honorable award. Soroptimist House of Hope would also like to give huge thanks to all of the SHOH Staff, volunteers, Board of Directors and our many supporters. In addition, a special thank you to Rhyan Miller,SAPT Program Administrator for Riverside University Health Systems – Behavior Health, Leonel Contreras, Executive Director, Riverside County Latino Commission on Alcohol and Drugs and Rick Mesa, Executive Director, The Ranch Recovery Services. Our collaboration with these individuals over the last few years has been an enormous help to bring SHOH into the 21st Century and allowing us to be stronger than ever! Soroptimist House of Hope (SHOH), is a nonprofit organization operating residential substance use disorder recovery programs for women. Located in Desert Hot Springs and Banning, SHOH provides a safe, nurturing environment in which clients can learn the life skills necessary to become productive members of society.